Cook the noodles in boiling water…by following the directions of the package. Each noodle package instructions are different. When done cooking, drain and rinse under cold water. Drain completely in a colander and set aside. Fluff up the noodles a few times until ready to serve. Bring a large pot of water to boil, enough to cover pork riblets. Add pork riblets and boil for 10 minutes then drain and wash under running cold water. This way we can remove all the residues from the bones for a clear broth. Peeled and devein the shrimp. Then add it to the food processor and add the ground pork. Add about 1 the jar of the shrimp paste with bean oil to the shrimp and ground pork mixture. ****I saved some for the tomato mixture****Next, add the rest of ingredients 6 garlic cloves, 1/2 white onion, 3 stalk green onion, 2 eggs, 1/2 teaspoon salt, and 1/2 teaspoon black pepper. ****I prefer the paste in the jar better than the can. It is a little more expensive than the canned ones…but I find the flavor is better. Combine all together in a large mixing bowl or into the food processor bowl. Pulse a few times to get the shrimp, ground pork, white onion, green onions, garlic and seasoning …..well blended. 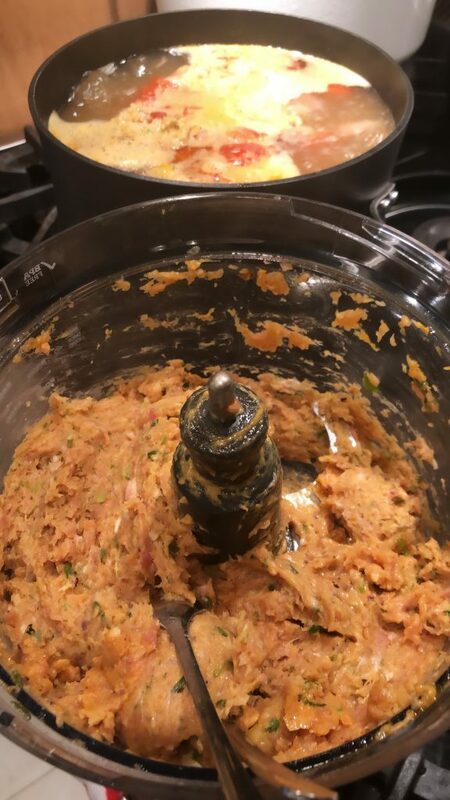 Once the mixture is nicely chopped and blended….set aside. 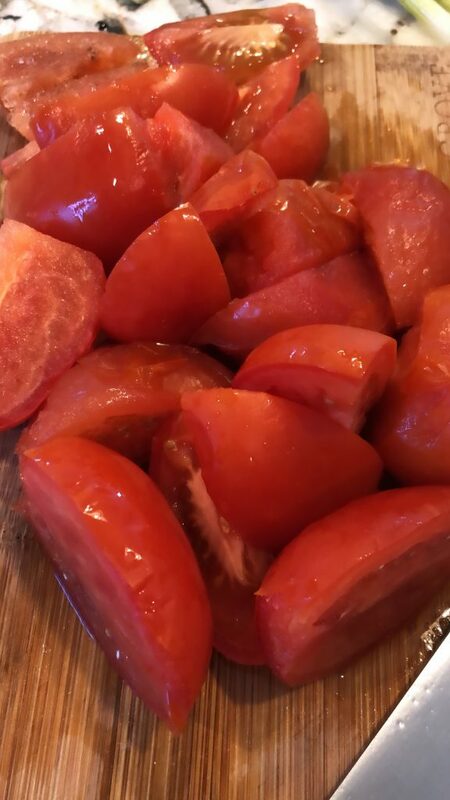 To make the sautéed tomato, heat a large skillet over medium high heat then add about 2 teaspoon oil from the jared shrimp paste and 2 tablespoon diced shallots/onion. Sauté for 1 minute then add 1 tablespoon of minced garlic (about 3 cloves minced garlic) Sauté for 30 seconds to 45 seconds then 1/2 teaspoon salt, 1/4 teaspoon sugar and 1/4 teaspoon cracked black pepper. Sauté for 2 to 3 minutes, tomatoes should be still nice and firm. Set aside. 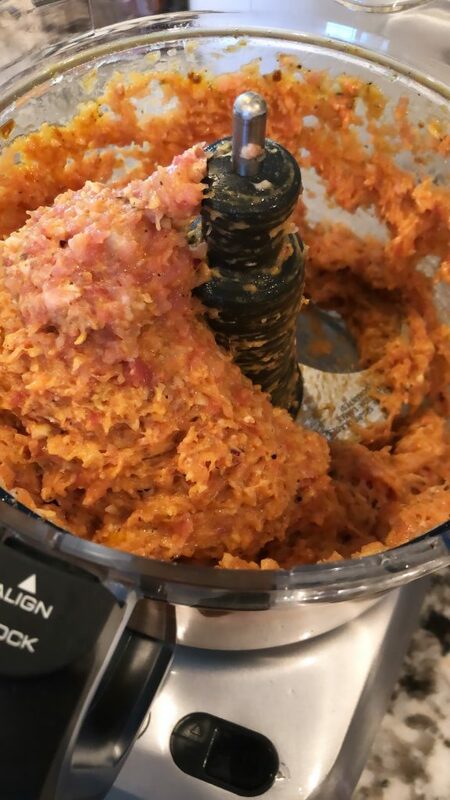 In a food processor…I blended all the shrimp and ground pork and etc together. I find that blended it in my food processor…gets everything nicely incorporated. So, all I have to do is spoon out from the food processor when my broth is cooked and boiling. Back to the broth, now add in the other jar shrimp paste with bean oil and fish sauce. 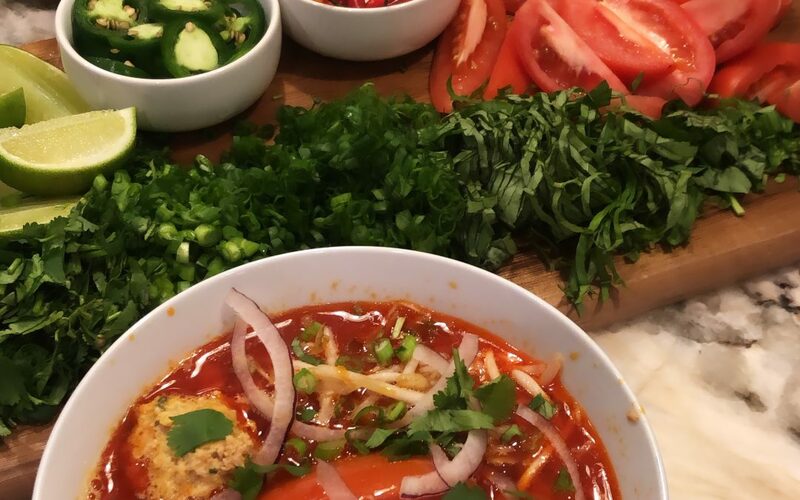 *****if you don’t like it spicy…then add in 1/2 at first then add in a teaspoon at a time until you get to the taste that you are satisfy with*** Taste if the seasoning is right for you, if not add more fish sauce ….add in 1 teaspoon at a time. 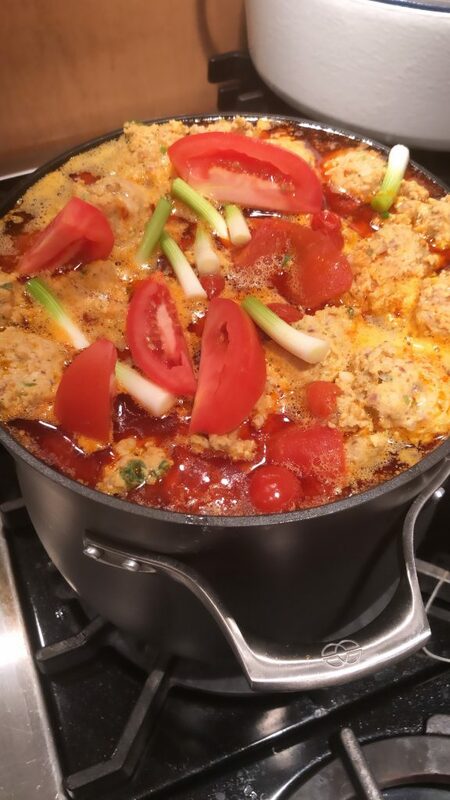 Once the broth is ready….turn the heat to medium high and add the shrimp mixture (1 teaspoon at a time) then add the sautéed tomatoes mixture. Bring the broth to a boil and keep cooking until the shrimp and pork mixture is floating to the top surface. Next, add in some fresh sliced tomatoes and green onion. Then continue to cook for about another 2 to 3 more minutes. It’s ready to serve! 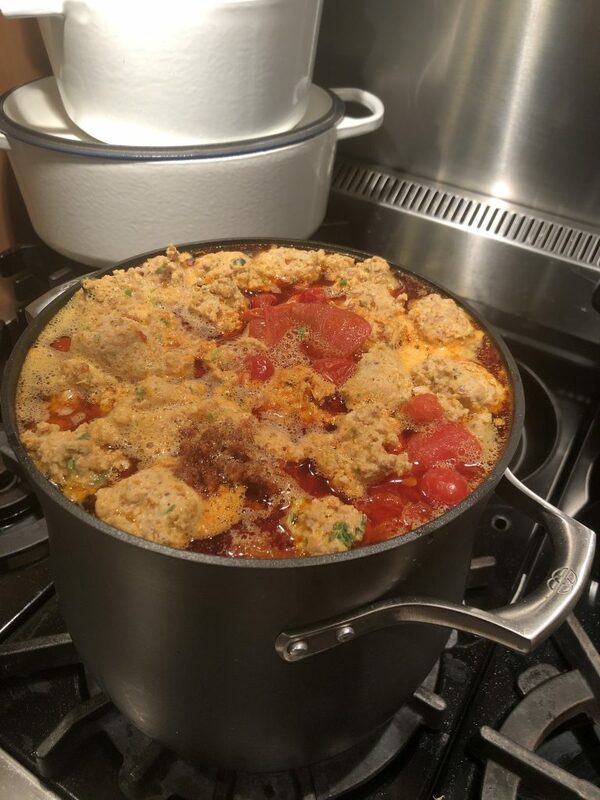 Once you have ladle the broth into individual bowls….reduce the heat to a simmer. Arranged cooked noodles into a large soup bowl then ladle the soup over the noodles. Garnish to your likings. ***I usually leave out the fish sauce, sriracha, and some shrimp paste just in case others might like to add it to their individual bowl. SIDE NOTE: I usually make it with crabmeat and pork but I had so much shrimp on hand that I made it with shrimp instead. 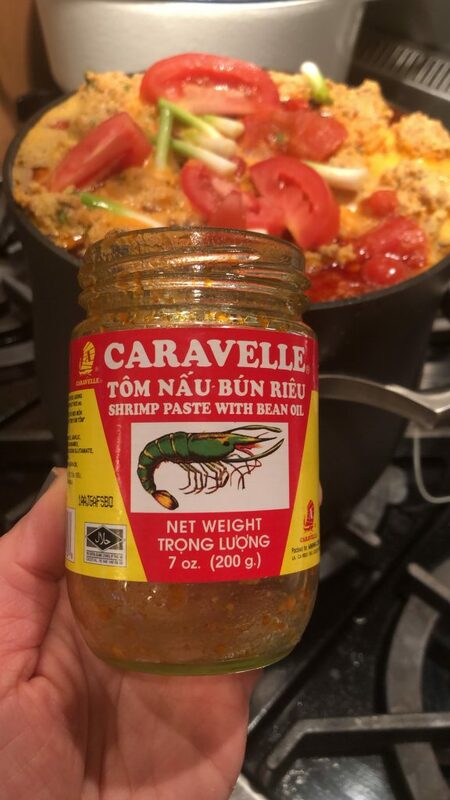 You can just substitute the crabmeat where I have shrimp…and use the crab paste with bean oil instead of the shrimp paste….or you can put both in there….I have done that before too.